The supervisory and regulatory environment for financial institutions remains challenging, but there are hopeful signs that both regulators and legislators are attempting to address issues important to community banks. Unfortunately, the legislative relief that is likely may prove to be quite modest.The prospects for regulatory relief remain constrained by the requirements of the Dodd-Frank Act and the concerns of banking agency policymakers that they need to be reasonably vigilant in preventing another financial crisis. The Federal Reserve Bank (“FRB”) of Minneapolis has recently undertaken to study the effects of increased banking supervision and regulation on consolidation among community banks and quantifying the costs of the additional regulation. In the first quarter of 2014, the FDIC produced a report on community bank consolidation following on its Community Banking Study released in December 2012. 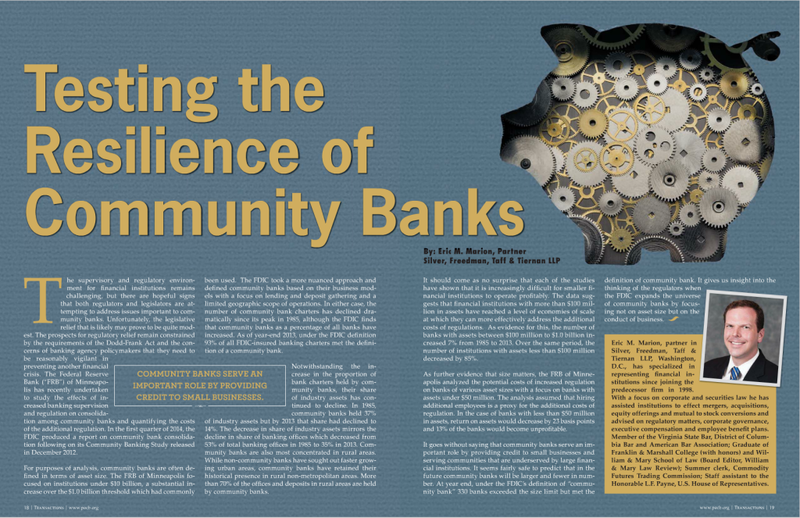 For purposes of analysis, community banks are often defined in terms of asset size. The FRB of Minneapolis focused on institutions under $10 billion, a substantial increase over the $1.0 billion threshold which had commonly Been used. The FDIC took a more nuanced approach and defined community banks based on their business models with a focus on lending and deposit gathering and a limited geographic scope of operations. In either case, the number of community bank charters has declined dramatically since its peak in 1985, although the FDIC finds that community banks as a percentage of all banks have increased. As of year-end 2013, under the FDIC definition 93% of all FDIC-insured banking charters met the definition of a community bank.Notwithstanding the increase in the proportion of bank charters held by community banks, their share of industry assets has continued to decline. In 1985, community banks held 37% of industry assets but by 2013 that share had declined to 14%. The decrease in share of industry assets mirrors the decline in share of banking offices which decreased from 53% of total banking offices in 1985 to 35% in 2013. Community banks are also most concentrated in rural areas. While non-community banks have sought out faster growing urban areas, community banks have retained their historical presence in rural non-metropolitan areas. More than 70% of the offices and deposits in rural areas are held by community banks. It should come as no surprise that each of the studies have shown that it is increasingly difficult for smaller financial institutions to operate profitably. The data suggests that financial institutions with more than $100 million in assets have reached a level of economies of scale at which they can more effectively address the additional costs of regulations. As evidence for this, the number of banks with assets between $100 million to $1.0 billion increased 7% from 1985 to 2013. Over the same period, the number of institutions with assets less than $100 million decreased by 85%. As further evidence that size matters, the FRB of Minneapolis analyzed the potential costs of increased regulation on banks of various asset sizes with a focus on banks with assets under $50 million. The analysis assumed that hiring additional employees is a proxy for the additional costs of regulation. In the case of banks with less than $50 million in assets, return on assets would decrease by 23 basis points and 13% of the banks would become unprofitable. It goes without saying that community banks serve an important role by providing credit to small businesses and serving communities that are underserved by large financial institutions. It seems fairly safe to predict that in the future community banks will be larger and fewer in number. At year end, under the FDIC’s definition of “community bank” 330 banks exceeded the size limit but met the Definition of community bank. It gives us insight into the thinking of the regulators when the FDIC expands the universe of community banks by focusing not on asset size but on the conduct of business. Eric M. Marion, partner in Silver, Freedman, Taff & Tiernan LLP, Washington, D. C., has specialized in representing financial institutions since joining the predecessor firm in 1998.With a focus on corporate and securities law he has assisted institutions to effect mergers, acquisitions, equity offerings and mutual to stock conversions and advised on regulatory matters, corporate governance, executive compensation and employee benefit plans.Member of the Virginia State Bar, District of Columbia Bar and American Bar Association; Graduate of Franklin & Marshall College (with honors) and William & Mary School of Law (Board Editor, William & Mary Law Review); Summer clerk, Commodity Futures Trading Commission; Staff assistant to the Honorable L.F. Payne, U.S. House of Representatives.